The Industrial Production Index for the first eight months of the year rose 0.9% with regard to the average for the same period the year before. 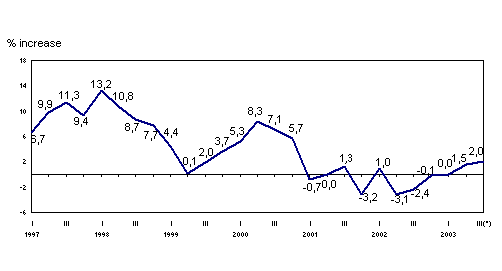 In August 2003, industrial production in the A.C. of the Basque Country grew 1.9% in absolute terms with regard to the same month in 2002, according to EUSTAT data. In homogenous terms of the working calendar, inter-annual growth amounted to 5.5%, since August had one working day less this year. The accumulated growth rate for the first eight moths of the year, with regard to the same period of the previous year grew by 0.9% in absolute terms and by 1.0% in homogenous terms of the working calendar. In August 2003, the most positive inter-annual variations, in absolute terms, were in the following sectors: “Oil Refining” (59.6%), "Transport material" (14.9%), "Rubber and plastic" (3.4%), "Leather and footwear industry" (2.9%) and "Timber industry" (2.7%). The sectors that suffered the most negative inter-annual growth rates were "Metal and non-metal minerals" (-10.9%), "Textiles and clothing" (-7.3%), "Non-metal industry" (-5.6%), "Electric material" (-5.2%) and "Paper, printing and graphic art" (-3.4%). According to the economic destination of goods, in August 2003 the inter-annual rate rose in Capital Goods (8.0%) and Intermediate Goods (3.1%), although the rate fell in Consumer Goods (–7.4%). In the first eight months of the year, the greatest accumulated growth, in absolute terms, was in the following sectors: “Oil Refining” (20.9%), " Textiles and clothing" (6.8%), "Rubber and plastic" (6.7%), "Transport material" (3.1%) and "Electric material" (2.4%). On the other hand, the most negative accumulate rates were those of "Leather and footwear industry" (-13.7%), "Other manufactured" (-5.4%), "Food industry" (-2.2%) and "Machinery" (-1.2%). The accumulated variations in the first eight months of the year show growth in Intermediate Goods (1.7%) and Capital Goods (0.1%), whereas Consumer Goods decreased by 2.9%. By provinces, the general index for August shows inter-annual growth in Alava and Bizkaia with 3.8% and 4.9% respectively, whereas the index decreases 3.6% in Gipuzkoa. In the first eight months of the year as a whole, the differences are less: Bizkaia and Gipuzkoa show an accumulated growth of 1.6 and 0.7% respectively, while Alava shows a slight fall of 0.1% with regard to the same period last year.